Posted August 10, 2017 by laurielmorrison & filed under The Writing Process, The Writing Process. Since I started writing fiction in 2008, I’ve written six full-length novel manuscripts, two of which will be published, but I still couldn’t tell you how, exactly, I write a book. When I sit down in front of a blank document, ready to start a new project, I feel a mix of confident excitement (This could be the best thing I’ve ever written!) and slightly terrified wonder (How did I shape those other manuscripts into anything remotely book-like? How do I know I’ll be able to do it again?). For every book I’ve finished, I’ve had epiphanies about my characters and plot that I didn’t see coming. Those epiphany moments are exciting…but they’re fragile. I can’t plan for them, so I can’t guarantee when, or even if, they’re going to happen. I’m always on the lookout for helpful books and lectures about making the writing process more efficient and predictable. 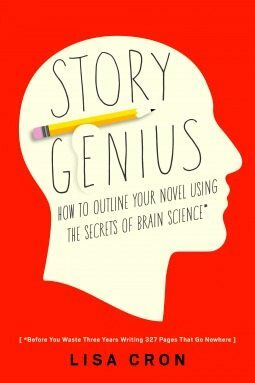 Earlier this year, after hearing enthusiastic praise from many fellow writers, I bought Lisa Cron’s Story Genius: How to Go Beyond Outlining and Write a Riveting Novel (Before You Waste Three Years Writing 327 Pages That Go Nowhere), eager to see if it could help me streamline my drafting process. The book includes a lot of great ideas about questions you can ask yourself and backstory scenes you can write before you start a draft. The idea is that if you do all of this work ahead of time, you won’t waste time and effort on pages and pages that you later need to scrap, because you’ll already have a clear and compelling vision for a story that will be satisfying to a reader. The process in the book seemed like a more structured, more front-loaded version of what I often end up doing when I write, and I had fun following Cron’s strategies for writing backstory scenes and making scene cards to plan out a plot. A tiny voice in the back of my mind said, “Do you really want to make scene cards? You’ve never planned scenes in that much detail before, and you’ve still managed to write some books that turned out pretty well.” But I’ve also started writing some books that didn’t turn out pretty well—that didn’t turn out at all, because I had to abandon them partway through when things just didn’t gel. And it was kind of a relief, to follow someone else’s instructions rather than diving into the uncertainty of a first draft the way I usually do. The problem was that after a while, I had to admit to myself that the scenes I was writing had lots of compelling story dynamics in theory, but I didn’t actually like them very much. They felt forced. That doesn’t mean that Story Genius is not a helpful book or even that it won’t work for me in another way. I actually think it’s full of really smart ideas and great examples, and many of the exercises will probably be useful for me if I use them partway through a draft, or at the revision stage, which is how a friend of mine is using them. But some of the ideas might not work so well for me personally, and that’s okay. As I tried to adhere precisely to everything the book says, I realized something about my own, imperfect writing process, which is that I tend to start with a character’s voice and then figure out more about the story as I write the first several chapters. There’s risk to that approach. Sometimes I don’t reach the epiphanies I’m hoping for. Sometimes the story doesn’t have a big enough hook to be marketable. But if I don’t begin with that vivid sense of what it sounds like to be inside a character’s head, I’m not all that excited about figuring out where the story goes. The experience of trying out the techniques in Story Genius reminded me of when I started teaching and tried to implement other people’s classroom management strategies. They were good strategies that worked for other people, but other people had different strengths and challenges than I did. I wasn’t able to manage a classroom effectively until I figured out my strengths and challenges and then took bits and pieces from other teachers’ techniques and molded them into something that felt right for me. And even then, I had to change my approach a little bit for every class I taught, just as I will probably need to tweak my approach for every new project I write. The full title of Story Genius suggests that the book’s methods can help writers to avoid wasting time (three years!) and work (327 pages) on a story that isn’t going anywhere. I only spent a few weeks and 30 pages or so on the idea I was exploring, but I don’t think I wasted any of that time or work even though those pages weren’t right. Maybe I would have been wasting time if I’d kept pushing forward for too long after I realized that things weren’t working, but I’m beginning to believe that nothing is truly wasted when it comes to writing. As I used the Story Genius methods, I learned something important about my uncertain but exciting writing process, and, because I wasn’t feeling invested in the book idea I thought I should pursue, I got up the courage to try out something different, that’s more a shift from what I’ve been writing recently. I’m only a couple of chapters into this new idea now, so I have no idea if the story will take hold or not, and I’m going with my old, uncertain process rather than trying to use Story Genius, at least for the time being. But I am hearing the character’s voice loud and clear, so for now, I’m happy. Story Genius has been on my wish list for a while now, but just haven’t gotten it. I actually like the idea of making scene cards. I love that this book has been so helpful for you. Thanks, L. Marie! It was helpful for sure, just not quite in the way I thought it would be. And I know the scene cards work for a lot of people! I could see them working for me at a different stage in the drafting process.